A Publication of Finished Work Fellowship, P.O. Box 27989, Prescott Valley AZ 86312 Copyright © 2008-2012 Lee Griffith. All rights reserved. Hello friends--as you can see from previous posts, I haven't posted in awhile, as I've been focused on studying and teaching and various areas of outreach. I would like all to know that videos of our Sunday evening Bible studies are available on Youtube. Just click on! "...and in various places there will be famines and earthquakes." "But all these things are merely the beginning of birth pangs." When the Lamb broke the fourth seal, I heard the voice of the fourth living creature saying, "Come." The sword, famine, pestilence, and wild beasts will kill a fourth of the earth's population. This is by providential permission. And notice that global warming, with which so many have been obsessed, is not involved. The widespread occupation with climate change is a political agenda not a genuine scientific agenda. Biological warfare may be involved in the disaster which is personified by the fourth horseman. The word "ashen," the color of the horse in Revelation 6:8, is translated from the Greek word chloros, which is a pale yellowish-green color. This word was used by the ancient Greeks to describe people who were pale from sickness. We tend to be more concerned about the threat of nuclear weapons, but biological attacks may well be means used by rogue nations to kill multitudes of human beings. In an article written March 5, 2007, Jerome Corsi noted that an American bio-defense analyst had come to a shocking conclusion: if the U.S. decided to invade Iran to curtail its development of nuclear weapons, Syria would be ready to respond with biological weapons of mass destruction. A variation of smallpox is likely the agent Syria will use. This can all be quite terrifying and quite depressing if we dwell on it. But it is important for us, as believers in Christ, that we do not lose perspective. As I wrote recently in a local publication, I’ve never been big on New Year’s resolutions, but I made one for this year (and plan on keeping it for the rest of my life here on earth): By God's grace, I resolve to focus more than ever, not on the disturbing things that are happening on earth, but on my heavenly citizenship, because, as the Apostle Paul recognized: “...our citizenship is in heaven, from which also we eagerly wait for a Savior, the Lord Jesus Christ…” (Philippians 3:20). According to the Bible, the world will not improve, but will become even more evil as we wait for the return of the Lord. Only with His return and the establishment of His kingdom, and ultimately a new heaven and earth, will all things be made right. Meanwhile, not only is every believer in Jesus Christ a citizen of heaven, but also an ambassador for Jesus Christ (2 Corinthians 5:20). During the time we remain in this evil world, we are responsible to represent Christ to a world which desperately needs to know His love.The Lord has committed to us the ministry (that is, service) of reconciliation (2 Corinthians 5:18). In fulfilling this service, we offer every member of the human race the invitation to be reconciled with God through the word of reconciliation (2 Corinthians 5:19): the good news that Christ died for our sins and that personal salvation and a relationship with God are available to anyone who believes in His Son Jesus Christ (John 20:31; Acts 16:31; Romans 4:5). When He broke the third seal, I heard the third living creature saying, "Come." I feel like saying, "Ho hum," when I hear these sincere egg-headed boys talking about how they are going to work out the poverty problem. All that has been accomplished is that it has given a good job to a lot of them, but so far it hasn't filtered down and been a blessing to the poor. It has never helped the poor to lift themselves up with any degree of pride. Why? Because the only Man who can lift up the poor is Jesus Christ. None of these egg-headed boys is able to do it. I am sorry to have to say that, but somebody needs to speak out against all of this tomfoolery our government is going through. All that this wasteful spending of money of money does is to create more bureaucracy and to sap our tax dollars. This is the sort of thing that is abroad today, but just think what it is going to be like in that future day. This which we are talking about in the Revelation is future. The only reason that I make application to today is to show that this is not unreasonable; it is going to take place. J. Vernon McGee said that some time before 1979. What would he think if he were still alive today? The landowner and the laborers entered into an agreement: a contract. As was previously mentioned, a denarius was a good day's pay for a good day's work. The third hour would be nine in the morning our time. A contract was made with these workers as well, but the wage was not specified. The landowner said that he would compensate the laborers justly. These workers would rely on the integrity of the landowner. The sixth and the ninth hour are the noon and 3:00 PM shifts. The final shift was hired at 5:00 PM. "When those hired about the eleventh hour came, each one received a denarius. "But he answered and said to one of them, 'Friend, I am doing you no wrong; did you not agree with me for a denarius? 'Take what is yours and go, but I wish to give to this last man the same as to you. The response of the landowner seems rather unusual. However, in the harvest of grapes, time is of the essence. The service of the later shifts might be of increasing value to the owner of a vineyard who was trying to get the harvest in while the grapes were still good. 1) Latecomers to eternal salvation have the same privilege of grace as the "early birds." 2) All spiritual rewards for believers are related to the sovereignty of God. 3) Spiritual rewards are given on the basis of mental attitude and faithfulness to the task--not the amount of work done. 4)Work done in a legal spirit is repudiated by God. All of the truths for the spiritual economy listed above are illustrated by the temporal events, actions, and attitudes described in the parable. But let's consider something about this parable that is often missed: In order for the spiritual principles conveyed by the parable to be true, the laws of the temporal world which illustrate the spiritual principles must themselves be valid, working principles. In other words, if the spiritual principles are true, there must be integrity in the illustration! When Jesus told a story to express spiritual truths, it would be unthinkable and unreasonable for the details about property and economics to be incompatible with the Lord's views. Bearing that in mind, let's look again at the owner's response: "Is it not lawful for me to do what I wish with what is my own?" (Matthew 20:15a) There you have it: a one-sentence summary of the divine viewpoint regarding property and economics! Think about this simple response of the business owner in the Lord's parable. Ponder it. The question asked by the owner of the vineyard expresses the divine endorsement of capitalism, an economic system in which there is private or corporate ownership of capital goods by private investments, and in which prices, production, and the distribution of goods are determined by competition in a free market. A free market means a market without economic intervention and regulation by government except to regulate against things such as fraud. Free-market capitalism is shown in the Bible to be the divinely authorized system of economics. This is evident in God's model for His covenant nation, Israel. It is also expressed in such passages Proverbs 14:23 and 22:29. In the divine viewpoint, it was the vineyard owner's right to what he wished with what was his own. The owner was not unjust. The fact of the matter is that he paid the first shift of laborers, the shift which was paid the least amount in proportion to their work time, a wage which was considered a decent wage for a day's work. But the point is that he paid them a wage that had originally been acceptable to them: a wage to which they had agreed by verbal contract. The fact that he chose to pay the same amount to those who started later was his right. Their service at a later time was, for whatever reason, more valuable to the business owner. Do you see a man skilled in his work? Class envy and the notion that wealthy people are evil have incited the economic systems of socialism, where the means of production and distribution of goods are owned and controlled collectively or by the government, and communism, a system based on holding all property in common, with the actual ownership ascribed to the community or state. Socialism and communism are directly opposed to the free enterprise sanctioned by the Bible. Notice that I am not presenting the talking points of political conservatism, but the doctrine in the Bible relative to the subject of economics. ... it is largely an illusion that unions are organized primarily against employers. The conflict ordinarily is not directly between management (or capital) and labor. It is basically between unionists and other workers or would-be workers. This is not to deny that employers may be injured by strikes, boycotts, and other coercive or violent union activities. Nor is it to deny ... that unions may pose a challenge and contest with governments, or that consumers and other businesses may be inconvenienced by union activities. Rather, it is to say that the intimidations, threats, and such violence as may be used by unionists is usually aimed directly at other workers. You might be thinking, "It's just too simplistic to assume that the Bible authorizes free-market capitalism and that there are no valid alternatives!" The truth is that if you are willing to check your philosophical and political ideologies at the door and accept the revealed divine viewpoint, capitalism and free enterprise are clearly what the Scriptures prescribe for the human race. Now, it is true that there have been many abuses of capitalism. Capitalism in our nation has deteriorated to crony capitalism, where the government is in bed with big business in a corrupt partnership where political favoritism results in unfair advantage for some businesses, while other business are unfairly penalized. This keeps politicians in power and some businesses prospering because of corruption, not free enterprise. Also problematic is a distorted concept of capitalism that is detached from the biblical principles designed to guide free enterprise. An example of this is apparent in the literature of Ayn Rand, an American novelist and philosopher who lived from 1905 to 1962. Her novel, Atlas Shrugged, published in 1957, imagined a breakdown of the United States economy because of government intervention and the redistribution of wealth. In Rand's paradigm, people are motivated either by a destructive selfishness which masquerades as altruism or an "enlightened" selfishness which is beneficial to society even though that is not its aim. Rand exerted a considerable amount of influence on the conservative movement, but her atheism and cold logic, which was basically opposed to charity and altruism, presented a model of capitalism which is really an empty shell of the system of enterprise that God designed. Rand's writings inspired a cult of college students who became known as "libertarians." However, their perception of free enterprise was detached from the divine model, which is guided by the principle of loving your neighbor as yourself. When man functions in business without accountability to God, he falsifies the free enterprise God designed for the blessing of the human race. Free enterprise under God will succeed. However, free enterprise will fall short when it operates under secularism. Thus, business will never be perfect in the fallen world, and that's why many people look at the shortcomings of capitalism, as it is practiced, and they do not like what they see. So what is the solution? The redistribution of wealth? Minimum wage laws? Labor unions? Why try to solve problems with other problems? The best solution to all of the economic problems in our nation would for the many Christians in our populace to return to the whole real of Bible doctrine as a way of life. 1. J. Vernon McGee, Revelation Chapters 6-13 (Nashville: Thomas Nelson, Inc.), p.44. 2. Clarence B. Carson, A Basic History of the United States (Wadley: American Textbook Committee) Vol. 4, pp. 103-104.. When He broke the second seal, I heard the second living creature saying, "Come." 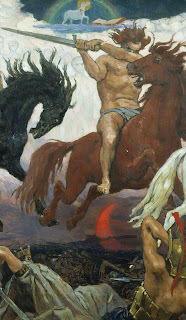 In our most recent study, we saw how the first horseman (Revelation 6:1-2), on the white horse, and wielding an empty bow, is symbolic of Antichrist initially emerging as one who will be reputed to be a peace maker. The second horseman, on a red horse, carrying a great sword, shows Antichrist's true colors: Antichrist will be a man of war! The final world empire under the authority of Antichrist will crush every opponent in its path. Included will be an agenda to destroy believers in Christ and to annihilate the Jewish race. Behold, a day is coming for the Lord when the spoil taken from you will be divided among you. Preterists generally agree that the destruction of Jerusalem in AD 70 was the fulfillment of the many prophecies which predict God's judgement against Jerusalem. In fact, many Preterists believe that "the Son of Man coming on the clouds of the sky with power and great glory," in Matthew 24:30, is symbolic of the Lord's judgment on Jerusalem through the Roman army. But Zechariah 14:3 describes the Lord fighting the nations attacking Jerusalem. Yes, fighting the nations, plural, and fighting the nations attacking Jerusalem, not fighting Jerusalem! By any stretch of the imagination, this passage could not have already been fulfilled. This is a phase of a final campaign, in which the "kings of the whole world" will be gathered together "for the war of the great day of God, the Almighty" (Revelation 16:14). Because of the ruthlessness of Antichrist, "the son of destruction"(2 Thessalonians 2:3), the world will suffer unprecedented carnage from the ravages of war. However, Antichrist will meet His end in the lake of fire (Daniel 7:11; Revelation 19:20). Although the Antichrist will initially disguise himself as a man who will bring peace to the world, it is only Jesus Christ who is able to bring genuine and permanent peace to mankind. Until He does, there will be wars and rumors of wars. And Jesus answered and said to them, "See to it that no one misleads you. Jesus warned His disciples against being misled by those who claimed to be the Christ. Commentators often suggest that there have been false Christs in every time, including the present: but is that really true? There have certainly been many leaders of cults who have been worshiped; even worshiped as deity. But in Matthew 24:5, Jesus, the Christ, the Jewish Messiah, was speaking to His disciples, who were Jews. His statement must be understood in the context of the Messiah of Israel. Christ (Greek christos, "anointed") translated the Hebrew word mashiyach in the Septuagint (the Hebrew Scriptures translated into Greek, completed about the middle of the second century BC). Mashiyach means "anointed," and is usually used to describe a consecrated person. Mashiyach translates into the English word Messiah in the prophesies about Christ in Daniel 9, verses 25 and 26. In these verses, "Messiah" identifies God's anointed, the One God has appointed to deliver and rule Israel. This person is known in the New Testament as Jesus Christ. During Daniel's seventieth week there will be many false Messiahs competing for the attention of the Jews. You may be wondering how this can be. Isn't the Antichrist going to be the one who will have every one's attention? Won't he be the counterfeit Messiah? No, that is oversimplifying it all. Antichrist, though he will have some Jewish ancestory (we'll get to that later), will appear on the scene as a Gentile and will initially be a benefactor to the Jews, confirming a covenant with them (Daniel 9:27). As the Antichrist rises to power, false claimants, professing to be the Messiah, will likely oppose him. In the middle of the seven year period, Antichrist will take his seat in the temple and declare himself to be God (2 Thessalonians 2:4). Yet his claim to deity is not a claim to be the Messiah of Israel. In fact, the Antichrist will attempt to wipe out the Jewish race. All the while, Israel will have the opportunity to either follow false Messiahs (which may cost them their lives) or to submit to and worship Antichrist. He is the little horn, in Daniel 7:8; 8:9-12. He is a king who is insolent and skilled in intrigue, in Daniel 8:23. He is the prince who is to come, in Daniel 9:26. He is the man of lawlessness, in 2 Thessalonians 2:3. He is the son of destruction, in 2 Thessalonians 2:3. He is the beast, in Revelation 13:3. Jerusalem and the sanctuary were destroyed by Titus of Rome in AD 70, about 600 years after Daniel wrote. But notice how the careful wording of this prophecy provides an opening for the Antichrist to come long after the destruction of Jerusalem in AD 70! It does not say, "The prince who is to come and his people will destroy the city and the sanctuary," but rather, "...the people of the prince who is to come will destroy the city and the sanctuary." The people--that is, the Romans--destroyed the city and the sanctuary in AD 70. The prince of these people will come in the future. This testifies of the revived Roman Empire, which is illustrated by the multi metallic image in Daniel 2:40-43 and the fourth beast with the ten horns and the emergence of the little horn in Daniel 7:7-8. The concept of the revived Roman Empire has been dismissed by some commentators in recent times, but the concept is Scriptural. So, Daniel was told that "the people of the prince who is to come" would destroy Jerusalem and the temple. This means that the Antichrist will be descended from the Romans who destroyed Jerusalem in AD 70. However, just because Antichrist will be descended from these people does not automatically mean that Antichrist will be of Italian ancestory--or even European ancestory! The Romans conquered most of the known world, and Roman citizenship was extended to people of many ethnicities. The fact that the Antichrist will be descended from the Roman people as they existed when Titus destroyed Jerusalem opens up the door to innumerable possibilities as to his ancestory! The emblem of Persia was the ram. Ancient Persian coins bearing the head of a ram have been found. The Persian king would go in front of his army wearing, instead of a diadem, a golden figure of a ram's head set with gems. The national emblem of Greece was the goat. Now it is very impressive that Greece would actually be named, because Daniel's vision was about two hundred years before the rise of Alexander the great! In fact when Alexander did come along, he was very impressed by this prophecy about himself, according to the historian Josephus. When Alexander headed toward Jerusalem, he was angry at the Jews because they had refused to help him fight the city of Tyre, and he had lost a lot of troops. The high priest Jaddua was terrified because of what Alexander might do. When Alexander approached the city, Jaddua and another priest went out from Jerusalem in a grand procession and showed him the prophecies of Daniel. Alexander recognized the prophecies that were about himself and thus showed favor on the Jews. Cassander received Macedonia and Greece in the West. Seleuceus received Babylon, Syria, and the area bordering India in the East. Ptolemy received Egypt, Libya, Arabia, and Palestine in the South. These four kingdoms will be resuscitated in some manner and apparently will be four of the ten kingdoms into which the revived Roman Empire will be divided. These four kingdoms were swallowed up by the historic Roman Empire and will live through, and be represented through, the revived phase. So, the Antichrist will be of Greek descent. Does this contradict the fact that he is of Roman descent? Of course not! You are probably quite aware that there were many Greeks in the Roman Empire. In fact, the Romans loved the art, literature, architecture, and religion of Greece and adopted many elements of these into their own culture. Daniel chapter 11 provides more details on the break-up of Alexander's empire and links him to the kingdom given to Seleuceus, which includes the areas of Syria, Mesopotamia, and Persia (which includes modern day Iraq and Iran). It is likely that Antichrist will emerge from that geographical area. Isaiah does not directly identify the king of Assyria as the Antichrist, but the resemblance is striking. Some students of the Scriptures believe that Isaiah 10:12-15 coupled with portions of Daniel 8 and 11 imply that Antichrist may well be of Assyrian descent and may come from the Assyrian region which is located in northern Iraq. There are presently people who are actually working toward an independent state in Northern Iraq! If the Antichrist will be Assyrian, does that conflict with him being the ruler of the revived Roman Empire? No! In fact, Josephus noted that many of the soldiers in the Roman army who destroyed Jerusalem under Titus were Middle Eastern. "Then the king will do as he pleases, and he will exalt and magnify himself above every god and will speak monstrous things against the God of gods; and he will prosper until the indignation is finished, for that which is decreed will be done. In the New American Standard translation, "He will show no regard for the gods [plural] of his fathers..." In the King James version, "Neither shall he regard the God [singular] of his fathers..." Elohyim is a Hebrew word which is plural in form, just as it is elsewhere in the Old Testament where it is translated God [singular], referring to the one, true God. The phrase, "the God of his fathers," is a Hebrew idiom which refers to the God of Abraham, Isaac, and Jacob. So, there is good reason to to believe that the Antichrist will be of Jewish descent, as well as the other ethnicities previously mentioned. There are other passages in the Scriptures that suggest he may be descended from the tribe of Dan. The first of the four horsemen in Revelation 6 portrays Antichrist as emerging as a powerful figure, but he is not yet waging war. 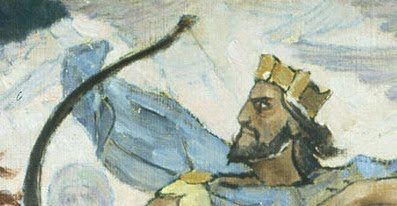 He is described as possessing a bow, but no arrow is mentioned. He will initially conquer without bloodshed. It is not until the breaking of the second seal, which releases the second horseman, a man on a red horse with a sword, that Antichrist wages war. During the beginning of Daniel's seventieth week, the Antichrist will negotiate a peace for Israel with her neighbors. He would have a hard time doing that if it his Jewish ancestory is apparent! Antichrist will initially recognize Israel's existence as a nation and will protect Israel with a confirmed covenant. But he will turn on Israel and will start a reign of terror in the last half of the seven year period. Many believers in Christ will be martyred, and the Antichrist will attempt to wipe out the Jewish race. Thus, while false Messiahs will abound during Daniel's seventieth week, Antichrist will not be one of them. He will actually oppose them, along with many other factions and forces, as he gradually acquires total political, military, economic, and religious control over the earth. 1. Flavius Josephus, The Antiquities of the Jews, Book 11, Chapter 8. 2. Flavius Josephus, The Wars of the Jews, Book 2, Chapter 13.7. On the Mount of Olives, Jesus was concerned that His disciples not be misled. To prevent the believers of Daniel's seventieth week from being misled, an apocalypse was given to John, on the island of Patmos. Much of that apocalypse parallels, and adds details to, the events Jesus set forth in the Olivet Discourse. "...and in various places there will be famines and earthquakes. Thus, these two accounts in the New Testament provide a brief outline of some of the major features of the seven year period that will close the end of the age. In the next installments of our study of Matthew 24, we'll explore these things in more detail. 1. John F. Walvoord, The Revelation of Jesus Christ (Chicago: Moody Press, 1966), p.123. 2. Marvin Rosenthal, The Pre-Wrath Rapture of the Church (Nashville: Thomas Nelson Publishers, 1990), pp.150-152. In part 5 of our study, I suggested that many believers have been misled throughout most of Church history in the area of eschatology (future events leading up to the consummation of history). In recent times, many believers are being misled by the Preterist approach to prophecy in the Bible. Preterism assumes that the major prophetic portions of the Scriptures, such as those in the Olivet Discourse (Matthew 24 and 25) and the book of Revelation, were fulfilled in the events associated with the destruction of Jerusalem in AD 70 by Rome. It is important to note that a number of genres are often represented in a particular book of the Bible. For example, while Matthew's Gospel is mainly narrative, the Olivet Discourse contains prophecy and apocalyptic. Of all the genres, apocalyptic is the most cryptic and mysterious. Apocalyptic literature is heavily symbolic, so commentators often differ with one another as to what the symbols mean. This genre often communicates through pictures, and interpreters have different ideas as to just how to understand the images. Just what the images represent and how they relate to historic or future events is often the subject of heated debate. There has been a recent trend among some evangelical interpreters to more or less lump together the apocalyptic in the Bible with the host of non-canonical writings that emerged during the intertestamental period and continued into the first two centuries. 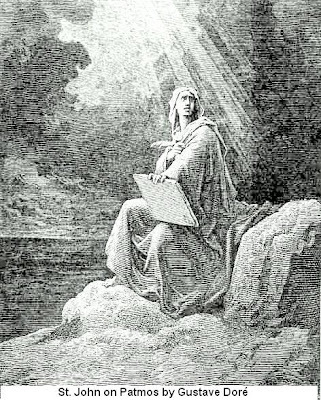 Writings such as The Testament of the Twelve Patriarchs, Ezra, Enoch, The Apocalypse of Baruch, and The Assumption of Moses share common features, such as visual images, extensive symbolism, angelic guides, and a focus on the end of the present age and the inauguration of the age to come. Because the apocalyptic literature in the Bible contains some of these attributes, it is argued (often by Preterists) that the biblical apocalyptic must be interpreted within the context of non-biblical apocalyptic. This new method of hermeneutics does away with the solid, conservative principle of assuming the author desired to be understood in literal terms, unless there is compelling evidence from the text that would dictate otherwise. That principle is replaced with the principle that symbolism and allegory are assumed unless the text informs the interpreter otherwise. There is definitely symbolism and allegory contained within biblical apocalyptic, but there are also specific persons and events: and there is prophecy. An important point that Grant R. Osborne makes is that, "It is impossible to distinguish ultimately between prophecy and apocalyptic, for the latter is an extension of the former." 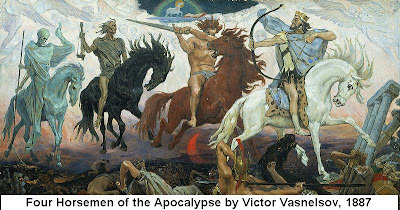 In fact, John calls his book an apocalypse in Revelation 1:1 (The Greek word translated "revelation" is apocalupsis.). But he calls the same book prophecy in Revelation 1:3. The imagery of biblical apocalyptic can represent reality generally or specifically, and I think that Darrell L. Bock makes a good point about the interpretation of the apocalyptic in the Bible when he says it is "...not a matter of literal versus figurative/allegorical approaches, but of how to identify and understand the reference of the figure in question." Preterism, with its supposed insight into the apocalyptic genre, is suddenly finding great popularity. A pastor I know, who was a premillennial dispensationalist for thirty years, has recently adopted the Preterist position and is now challenging the members of his congregation to learn to "think apocalyptically." He is now convinced that the thousand year reign of Jesus Christ, mentioned six times in Revelation 20, is not a literal thousand years during which Christ will reign in his prophesied kingdom. In his new viewpoint, the apocalyptic in the Bible has "radicalized" and reinterpreted the prophets and shown their words to be fulfilled in the present Church, which he calls the "eschatological Israel." I fully understand the importance of genre classification with regard to the accurate interpretation of the Bible, but there are abuses of genre classification as well. The oldest apocalyptic is in the Bible, and it was born out of prophecy and never came to stand out in absolute contrast with prophecy. Therefore, biblical apocalyptic is the genuine apocalyptic. The true apocalyptic genre began in some of the writings of Isaiah, Ezekiel, Daniel, Joel, and Zechariah. The non-canonical apocalyptic literature began to emerge in about 250 B.C. and flourished when the Jews were under the pressure of Antiochus Epiphanes. This literature was a vehicle of the Hasidic movement and became a religious-political tool. The non-canonical apocalyptic was not prophecy. In fact, it emerged well after the last book of the Old Testament was written, a time during which God was not providing prophecy. Because prophecy had ceased during a frame of about four hundred years, the writers of apocalyptic thought it necessary to explain the delay of God's kingdom and the suffering of God's people. Apocalyptic became a literary form which tended to rewrite history as pseudo-prophecy, while not even claiming to be prophetic. Not only was the extra-biblical apocalyptic not prophetic--much of it was just bad literature! G.B. Caird described 1 Enoch as one of the world's six worst books, and he said that 4 Ezra (2 Esdras in the Apocrypha) was responsible for many of the worst features of medieval theology. I can imagine a Jewish writer of the second century B.C. reading the book of Daniel and thinking, "Hey, I think I could write like that!" The apocalyptic genre became a literary style without being inspired by an actual divinely revealed apocalypse. Here is my question: Do we interpret Old Testament apocalyptic by the standards of the non-prophetic, non-inspired apocalyptic literature which came later? Or, do we interpret Old Testament apocalyptic in its own right--in its own development within the Canon? After all, Old Testament apocalyptic is the original apocalyptic! My point is, the extra-biblical apocalyptic was an aberration of the original! Now, it is true that in the non-canonical apocalyptic literature, numbers often represented concepts more than literal count units. But let’s consider what the result would be if we choose to interpret the Old Testament apocalyptic within its own time and not by the features of the non-canonical literature which came later. I think that it is very significant that in Daniel 9:2, Daniel was observing in the Scriptures the number of years revealed to Jeremiah that the people would be in captivity (and that was, without dispute, a literal 70 years), and then Daniel received the information on the 70 units of 7 prescribed for Daniel's people, the Jews (Daniel 9:24-27). Since the 70 years in captivity were literal years, is there any reason to assume that the 70 units of 7 were not to be taken literally? I don't think so. And, is there any indication in the development of apocalyptic in the Old Testament that new standards of interpretation must be adopted? Is there an indication that eschatological events are not to be taken literally? None that I know of. When we come to the Book of Revelation, do we assume that the numbers in the book, such as the 1000 years, should not be taken literally because of the way that numbers were used in the some of the non-canonical apocalyptic? Or, do we refer to the genuine article and the roots for the apocalypse John received: the Old Testament apocalyptic--where the numbers mean the numbers? To me it only makes sense to interpret the Book of Revelation and other eschatological portions of the New Testament, like Matthew 24, by going to the Old Testament roots. In Revelation there are many hundreds of allusions to Old Testament passages. Let’s compare spiritual with spiritual (1 Corinthians 2:13). The Bible is its own commentary: I’m really not that concerned with what kind of form that literature took on outside of the Bible, and I’m certainly not going to use non-canonical writings as a standard for interpreting the Scriptures! One of the greatest challenges modern communicators of doctrine face is their incomplete understanding of the times and cultural background in which the Bible was written. We have some writings and artifacts, and some archaeological ruins, but there is always the problem of our distance from the biblical world. We’ll never understand the ancient world as precisely as those did who inhabited it. With regard to the interpretation of the one thousand years in Revelation 20, I do find it meaningful that the early Christian writers of the first and second centuries, Papias, Justin Martyr, and Irenaeus were all born when apocalyptic literature was still being written--and all three believed the thousand year reign of Christ to be a literal one thousand years! Now, I’m not saying these men and others did not have some strange ways of applying that thousand years historically--but my point is, they interpreted the thousand years literally, and they did not have the previously mentioned problem of distance from the time in which Revelation was written. They were no doubt very familiar with the apocalyptic genre, being born while it was still being published! (It is believed that Papias, in his youth, may have been a student of the Apostle John.) Premillennialism appears to have been the dominant view in the Church until the time of Augustine, though there were some who were not Premillennialists. I understand the necessity of recognizing figures of speech and symbolism in the Bible. However, references to the one thousand years in Revelation 20 describe a period of time marked off by events specifically taking place both prior to it and after it. To allegorize the Millennium and to remove the distinction between Israel and the Church, Christ's Body, is to send repercussions throughout the way we interpret the whole realm of the Canon. How we view the very essence and integrity of God is affected. Does He actually keep (and possess the ability to keep) the promises He has made to those to whom He made the promises? If His promises to the racial species He established through Abraham are not to be taken literally, then maybe the promises He made to the members of Christ’s Body are not to be taken literally. In the apocalyptic language of Revelation, John often conveys truth through correspondence. By comparison, he is equating things from the world in which he lived to the future events he sees in the vision. Through this language, we are able to perceive a solid outline of the events which will occur during Daniel's seventieth week, and the believers who live during that time will be able to make sense of many of the finer details that we may not understand. 1. Grant R. Osborne, Baker Exegetical Commentary of the New Testament (Grand Rapids: Baker Academic, 2002), p.13. 2. Craig A. Blaising and Darrell L. Bock, Progressive Dispensationalism (Wheaton:Victor Books, 1993), p.93. The disciples who came to Jesus privately on the Mount of Olives had just asked Jesus a question about how the destruction of the temple would fit in with the rest of God's prophetic plan: specifically, the end of the age and the Coming of Christ to rule His prophesied kingdom. Jesus introduced His response with a caveat: "See to it that no one misleads you." In order for them to cope with the unique seven year period prophesied by Daniel (Daniel 9:24-27), Daniel's seventieth "week," they would need to accurately understand the nature of prophetic events and their sequence. Although the Church, Christ's Body, will no longer be on earth during Daniel's seventieth week (1 Thessalonians 4:16-17; 1 Corinthians 15:51), it is important for us to not be misled as to the events of eschatology (future events leading up to the consummation of history), so that we may see how the unique dispensation in which we live fits into the framework of God's overall plan for mankind. It is unfortunate that the Church, on the whole, has been misled in the area of eschatology since the fourth century. The word paradigm comes from the Greek word paradeigma, a pattern. A paradigm, in a general sense, is an example serving as a model. The word is commonly used today to mean an assumption; a frame of reference; the way we perceive things to be. In 1962, Thomas S. Kuhn was responsible for popularizing the term in his book, The Structure of Scientific Revolutions, which shook the foundations of the scientific community. In it he described how the real scientific breakthroughs of human history are the result of breaks with traditional ways of thinking, in which old paradigms are replaced by new and competing ones. For example, in the 2nd Century, Alexandrian astronomer Ptolemy's paradigm was a universe with the earth at its center and the sun revolving around it. This notion was defended for centuries, even as conflicting evidence increased. Over a thousand years later, Copernicus replaced Ptolemy's model with the new and controversial theory that the earth and the other planets revolve around the sun. In Kuhn's view, science is not a steady and cumulative gathering of information, but a series of relatively peaceful periods of time broken by revolutions of thought through which new paradigms replace old ones. Kuhn described the change which causes scientific revolutions as a "paradigm shift." Though Kuhn believed that existing paradigms must be lived in and explored before a break can be made, a scientific revolution occurs when an older paradigm is replaced in whole or in part by new and incompatible one. In a paradigm shift, the new paradigm does not build on the preceding one, but supplants it. From a political perspective, Constantine's Edict of Milan, issued in AD 313, constituted the formal beginning of a major paradigm shift that signaled the end of the ancient world and the beginning of the medieval period. That edict legitimated Christianity and impressed upon it the Empire's stamp of approval. "Hi, I'm From the Government and I'm Here to Help You!" was a post in which I wrote about the profound change brought about by Constantine's Edict of Milan (click here to read). Under the edict, religious persecutions were abolished and liberty of worship was declared for all. Constantine himself had professed faith in Christ and invited his subjects to join him. Three centuries of the cruel persecution of Christians had been ended. It looked like the principle of freedom to obey God without interference had finally been recognized and embraced by the human race. But alas, Constantine turned out to be the quintessential politician, seizing every possible opportunity to gain the political support of both Christians and pagans throughout the Empire. Constantine went out of his way to make concessions so that Christianity would be more appealing to the heathens. Sunday (named for the sun god), the weekly holiday of the pagans, was declared to be a legal holiday ("holy day"). With the exception of farming when necessary, work on Sunday was outlawed, which made many pagans very happy. But Constantine became very popular among Christians, too. He proclaimed Sunday the "Christian Sabbath," and more and more legislation provided privileges for Christians. The Church received large gifts of financial support from the State. The State payed for lavish church buildings (which happened to resemble pagan temples). The Roman government also provided tax exemptions, political appointments, exemptions from military proscription, and other benefits to those who converted to Christianity. The sad result was that many pagans "converted" only because of the incentives they received from the government. The Christian church had become thoroughly paganized, something that never would have happened had the Church and State remained separate. If that wasn't bad enough, it was not long after the reign of Constantine that the ancient Roman practice of persecuting those whose religions were not permitted was suddenly applied in a different way: Emperor Theodosius I issued an edict in AD 380 that established Christianity as the exclusive religion of the Empire. Those who deviated from the form of worship approved by the State were punished as heretics. What had appeared to be a new era of righteousness and freedom of religion had turned into an era of corruption and religious tyranny. Allen goes on to note the theological paradigm shift, but in order to make any sense of what he describes, we must recognize the three theological approaches to the one thousand year reign of Christ mentioned six times in Revelation chapter 20. They are Premillennialism, Postmillennialism, and Amillennialism. Premillennialism (which I believe is the correct view) is based on a literal, or normative method of Biblical interpretation. In the premillennial view, Christ will return to the earth prior to the one thousand year reign, inaugurate His prophesied kingdom on earth, and reign over that kingdom for a literal period of one thousand years. The early Church was largely, though not uniformily, premillenial in terms of eschatology. The early Christian writers, Papias (who wrote in the first half of the second century and when young may have been a disciple of the Apostle John), Justin Martyr (who lived from AD 100-165), and Irenaeus (who wrote in the second half of the second century), were premillennialists. Postmillennialism holds that man, through the effect of the gospel, will bring in the kingdom, and after one thousand years of man's progressive improvement, Christ will return. Postmillennialism is relatively new, being traced to Daniel Whitby, a minister who lived in the seventeenth century. Postmillennialism declined significantly in the second half of the twentieth century. Postmillennialists had been persuaded that the First World War had been the war which would end all wars, and the gospel was now going to purify the world. Then, two decades later, the Second World War came, which really took the wind out of their sails! Amillennialism takes a non-literal view of the one thousand years of Revelation 20. The amillennialist views the thousand years as symbolic of a spiritual kingdom operating during an unspecified period of time, the time between Christ's two advents. The amillennial system was pioneered and developed by Augustine of Hippo (354-430), using Origen's allegorical method to interpret eschatological events. From a theological perspective--specifically an eschatological one -- the Edict of Milan also signaled a monumental paradigm shift--from the well-grounded premillennialism of the ancient church fathers to the amillennialism or postmillennialism that would dominate eschatological thinking from the fourth century AD to at least the middle part of the nineteenth century. Yet ... the groundwork for this shift was laid long before Constantine issued the Edict of Milan in AD 313. In the two centuries that led up to the edict, two crucial interpretive errors found their way into the church that made conditions ripe for the paradigm shift incident to the Edict of Milan. The second century fathers failed to keep clear the biblical distinction between Israel and the church. Then, the third century fathers abandoned a more-or-less literal method of interpreting the Bible in favor of Origen's allegorical-spiritualized hermeneutic. Once the distinction between Israel and the church became blurred, once a literal hermeneutic was lost, with these foundations removed, the societal changes occasioned by the Edict of Milan caused fourth century fathers to reject premillennialism in favor of Augustinian amillennialism. Augustine thought that the Church is the spiritual kingdom of God and is presently in the Millennium, though not a literal millennium of a thousand years with Christ bodily reigning over the earth. Can you see the correlation between the historical and theological paradigm shifts described by Allen? Bad doctrine in the Church paved the way for the political antics of Constantine and the readiness of the Church to get into bed with the State--and in turn, the corruption that resulted contributed to more bad doctrine! As the Church became an instrument of the State, there no longer seemed to be an interest in the grand theme of Bible prophecy: the reality that Messiah will return to earth and establish His kingdom. People assumed that the marriage between church and state indicated that Christ's kingdom had come! Then, by the time Augustine was formulating his doctrine, he became disillusioned because the prophesied kingdom described in the Scriptures did not match the condition of the world in which he lived. Therefore he concluded that the one thousand year earthly reign of Messiah could not be literal. If it existed between the two advents of Christ, as Augustine supposed, the kingdom must be a spiritual kingdom only, existing in the hearts of believers who are faithful to Christ. In the last 150 years, the truth of Premillennialism has, to a large degree, been recovered within the Church. However, Amillennialism is on the rise again, and the results could prove disastrous in both the political and spiritual realms. Let us heed the Words of Christ: "See to it that no one misleads you." 1. Lee Griffith, Then the Proconsul Believed (Prescott Valley, AZ: Finished Work Fellowship), 2006, pp. 1-2. 2. Matthew Allen, Theology Adrift: The Early Church Fathers and Their Views of Eschatology, http://bible.org/article/theology-adrift-early-church-fathers-and-their-views-eschatology. 1. When will these things happen? 2. What will be the sign of your coming and of the end of the age? The first question regarded the timing of the destruction of the temple. How did it fit in with the other future events predicted by the prophets? That question was considered in Part 3 of our study. The second question was in two parts. First, the disciples wanted to be educated as to the sign of the Lord's coming. The word translated "sign" in Matthew 24:3 is the Greek word, semeion, which means a token signaling a future event. Jesus answers this part of their question in great detail in verses 15-22, which we will be studying in the future. The second concern of the disciples was: What would be the sign of the end of the age? This is addressed by the Lord in verses 23-51, which we will also study in future posts on this blog. I am going to devote this current post to a subject that is crucial to understand if Bible prophecy is going to make any sense at all to us: What did the disciples mean when they used the term, the end of the age? During the time of the Old Testament and the time of Christ's earthly ministry, the Jewish perspective of history was very precise and simple. History consisted of two ages: the present age and the age to come. The present age was the age in which all Israel was waiting for Messiah to come and establish His kingdom. The present age would end in the devastating judgment predicted by the prophets and would be terminated by the appearance of Messiah. The age to come was the future age, introduced by Messiah's coming, an age in which the many blessings promised to Israel through the prophets would be fulfilled. The angel Gabriel was imparting God's guarantee to Daniel that he would be physically resurrected to receive his inheritance of the blessings of the covenant promises God gave to Israel. Daniel will be resurrected at the end of the seventieth week designated for Daniel's people (Israel), in Daniel 9:24-27 (see part 3). Daniel will receive his resurrection body and allotted his portion at the end of the age (the age which will be terminated by the coming of Christ to establish His kingdom) to enjoy in the age to come. It is unfortunate that because they do not understand the dispensational significance of Matthew 12:32, many believers think they've "blasphemed the Holy Ghost" and are doomed to everlasting condemnation because they cannot be forgiven. But the context of Matthew 12:22-32 shows us that what Jesus was saying was addressed to many, but not all, of the people of one generation of the nation of Israel: the generation He was actually speaking to. God would forgive Israel for the sins committed against the Son. In fact, in Luke 23:34, the Son said, while hanging from the cross, "Father, forgive them, for they do not know what they are doing." But after Israel had spoken against the Son of Man, The Holy Spirit was sent at Pentecost, and great signs and wonders took place through the apostles. God then offered Israel the opportunity to repent, and if Israel would respond, Jesus Christ would return to reign over the prophesied kingdom (Acts 3:19-21). But Israel did not repent. In fact, Israel's hostility toward Christ climaxed in the stoning of Stephen by the Sanhedrin, the ruling council of Israel. Just before he was stoned to death, in Acts 7:51, Stephen accused the leaders of Israel of resisting the Holy Spirit, just as their fathers had. In Matthew 12:32, Christ was addressing that one generation who would go into the Pentecostal era. Many in that generation would resist the testimony about the identity of Christ which was overwhelmingly confirmed by the activity of the Holy Spirit. Those in that generation who ultimately and categorically denied that testimony were not forgiven of it; and that generation of Israel will not be forgiven in the age to come either: because they died in their unbelief! A future generation of Israel will accept God's testimony about Messiah (Zechariah 12:10). But notice, in Matthew 12:32, that Christ embraced the same perception of history as the Jews of the Old Testament: this age and the age to come. ...and they said to him, "You see, brother, how many thousands there are among the Jews of those who have believed, and they are all zealous for the Law." Many believers are terrified, thinking that this passage is about a Christian losing his or her salvation and going into everlasting condemnation. That's not what it is about at all. This is about blessing from God for responding to the truth of His word versus the cursing of divine discipline for choosing to remain under the Law as if Christ hadn't even gone to the cross to justify us! The Law has never justified anyone (Acts 13:39; Romans 3:20). Incidentally, the city of Jerusalem was burned by the Romans in AD 70, shortly after the Letter to the Hebrews was written. Yes, Paul, a Jew who had been raised with the Jewish viewpoint of history (a viewpoint acquired from the Scriptures), perceived history in terms of that dichotomy when he wrote his epistles: this age and the one to come. Now, it is true that between the time that Christ had spoken about what He had called "this age and the age to come," and the time that Paul wrote about "this age" and "the one to come," a new dispensation had been inaugurated (Ephesians 3:2). But don't confuse dispensations with ages! An age is a period of time, while a dispensation is a particular arrangement by which God administrates to angelic or human beings and regulates their affairs. A dispensation is not a period of time, but an administration within a period of time. The present dispensation, a mystery which has interrupted the prophetic calendar, is operating within a continuation of the present age. After the Rapture of the Church (1 Corinthians 15:51; 1 Thessalonians 4:16-17), the prophetic plan will resume, and this present age will continue for seven years, until the Second Advent of Jesus Christ introduces the age to come. If "this present evil age" referred to by Paul (Galatians 1:4) ended in AD 70 (not many years after Paul wrote), then the logical conclusion would be that the instruction of Paul's epistles for this age (Titus 2:12) was directed only to believers until AD 70. Amazing! When the prophesied kingdom was later formally offered, in Acts 3:19-21, had Israel accepted the offer, Daniel's seventieth week would have commenced, followed by the Second Advent of Christ and the establishment of His kingdom. That is why Jesus was instructing his disciples as to the nature of the final years before the kingdom, and how to survive until the return of Christ. Because Israel failed to respond to that offer, the establishment of the kingdom has been postponed. Thus, the Lord's discourse from the Mount of Olives will now be directed toward believers in the future, when Daniel's seventieth week begins. After His resurrection, Jesus provided further instructions to His disciples as to their activity in the brief period of time leading up to Christ's return. These instructions are contained in what is commonly perceived to be the "Great Commission" for the Church, Christ's Body, but is actually a continuation of the only program the disciples had been familiar with when they received this commission: the kingdom program. Jesus promised that He would be with His disciples (not physically, but in terms of power and provision) unto the end of the age. If this passage applied to the Church, Christ's Body, that would mean that there would be no Rapture prior to Daniel's seventieth week. However, this commission is addressed to those who will be on earth during the seven years preceding Messiah's kingdom! Scripture quotations taken from the NASB.http://www.lockman.org/ In Titus 2:11-12, the explanation in brackets is the author's. Matthew 16:28 is the author's translation. is the author of this blog and Pastor of Finished Work Fellowship in Prescott Valley, AZ.